Did you know that if you break certain Twitter rules, that you could end up in "jail"? "a nice place for everyone.” If you tweet too many times in a single day, you may find your account disabled. Twitter Jail has also become a way of identifying accounts created for spamming purposes. To stay out of Twitter Jail, there are a few policies that Twitter asks users to follow. The Twitter Help Center lists all of these policies. First, you can only send 250 Direct Messages per day. Second, you can only send 1,000 tweets per day. This includes re-tweets and original tweets. Also, one can only make four changes to their account email per hour. As for following other Twitter users, one may only follow 1,000 per day, although there are more specific policies in place regarding this rule. However, the number of followers you can have has no limit. And do not be fooled; these limits are calculated and/ or monitored from all devices- from computers to smart devices. If an account goes over any of these limits, they will receive an error message. Some limits are time-based and will give you a specific amount of time in which you are not allowed to tweet. Users say thetime in which you can not tweet could be from an hour to a few hours per infraction. 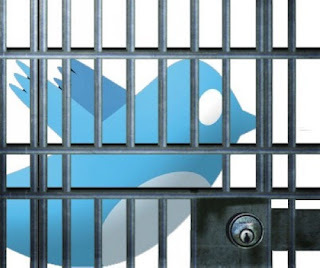 Remember to watch your tweeting habits and keep your Twitter account from behind bars! Bree Kingston is the Head Coordinator Intern for the TexasSocial Media Research Institute and a graduate assistant for Tarleton State University’s Department of Agricultural and Consumer Sciences. You can find her on Twitter @Bree_Kingston.